As explained in the previous post, I modified my Sangean ATS 909 receiver by equipping it with a digital RDS output. May it now be told in pictures. Of course everything had to start from reading some service manuals and data sheets. Energy drinks were also necessary. Yes, I colored the board schematic with color pencils for ease of use! I figured I would need four separate outputs from the decoder (data, clock, quality bit, and ground) so I chose a 4-pin mini-DIN plug in one end of the cable. The other end is a familiar DB-25. Data is input via the parallel port's ACK, BUSY, and Paper Out pins; I picked a random GND pin for the ground. The RDS circuit is hidden under the corner of an RF shielding plate. It would have been tedious and mistake-prone to remove the shielding, so I just used my precision soldering skillz and left all the wires outside the plate. Now the chip was wiretapped. The front cover has a mini-DIN-sized placeholder-looking feature that I used for this purpose. Probably it was related to the speaker's airflow though. I hotglued the 4-pin connector in place. Holes in the control board came in handy when wires needed to be taken through. I'm relieved the radio still works! Next it will be time to test the connection. It won't happen until my cheap parallel-to-USB converter arrives in the mail, since my laptop is new enough not to have a parallel port. Update: The converter (idVendor=1a86, idProduct=7584) arrived, but apparently it just emulates a USB printer and low-level parallel bit-banging is not even possible. So I took the thing apart and built a simple twin-channel voltage divider in place of its internals that I then attached to a stereo phone jack (all parts salvaged from an old radio). Data goes to left channel, clock to the right; I'll just have to ignore the quality bit. I connected this to the sound card's line in and behold! The clearest possible data and clock signals on separate channels! This means I can completely comment out my software clock recovery and PLL. I rolled the FM dial and logged some stations. 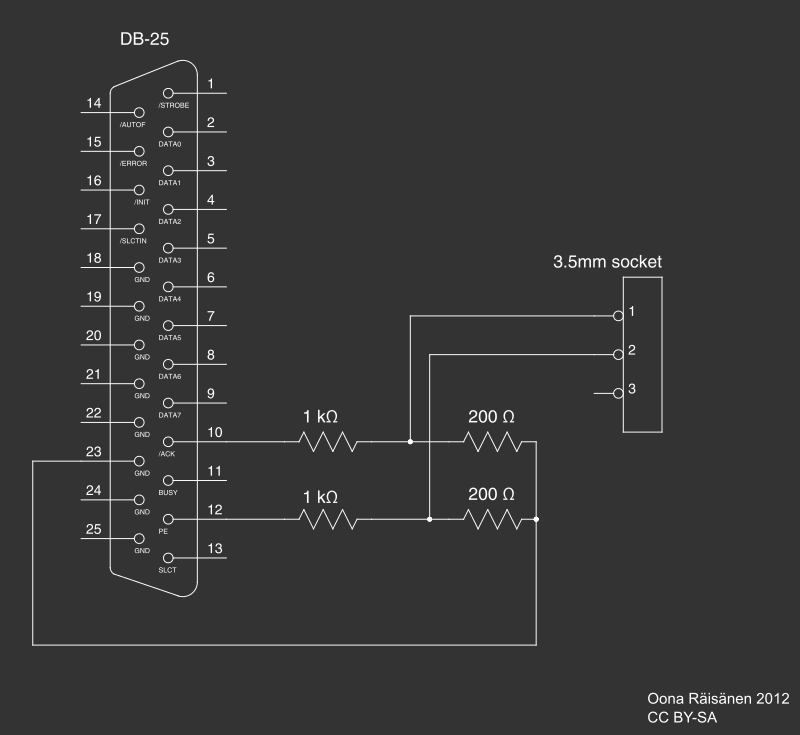 I have a modded Ramsey kit SCA decoder, which uses a PLL chip to decode the SCA signals at 67 and 92Khz. It will also lock onto the 57Khz RDS carrier (here in the US it's called RBDS) and covert it down to audio frequency data. I am only interested in the "in the clear" data, such as artist/song title and station ID. The kit is fed by an analog FM radio that outputs baseband. The Ramsey kit is modded to improve the input filter. (It was allowing too much audio frequency signal through, distorting the SCA and the RBDS signals.) In this application, there is no steady clock frequency, only the data. 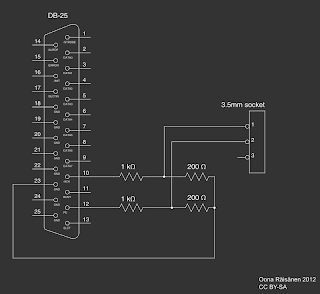 The PLL does have a test point with the running frequency, but that is frequency-modulated, not steady. 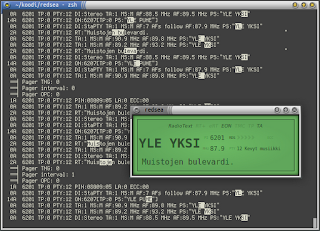 I can write a general Perl script for baseband decoding. As long as it's fairly easy to integrate into a DOS environment, that would be good. :) DOS can be easily run within a window. 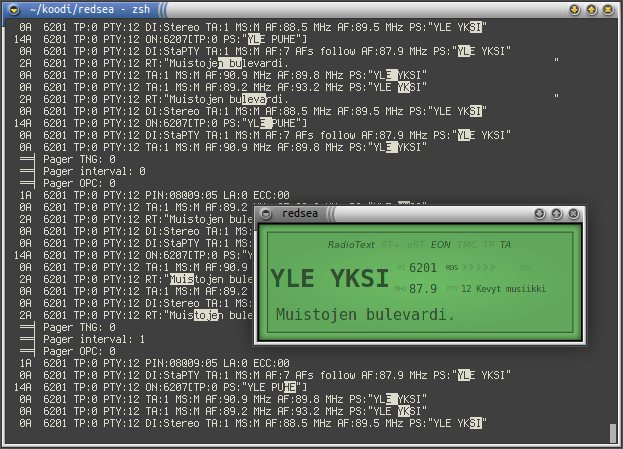 I have a GWBASIC program running in a window at the radio station where I work. It feeds our artist/title date to our streaming server as plain text. It's been running flawlessly, 24/7 (with only an occasional reboot) for over a year... so I'm quite pleased with it... even if it is antiquated. :) The most certain way to get it done is to write it yourself. This is a really cool application. How are you displaying your output as a gui? Hi, the window and text are rendered by Gtk+.